Featuring a variety of interactive activities that are as fun as they are educational, this innovative program gently challenges children. The Heart Shine™ technique and Heart Breathing Pacer™ help children build a solid emotional foundation, positive relationships with family, friends and classmates and self-awareness. Scientific research shows the social-emotional skills the Sunshine Secret teaches are essential for achieving success in school, work and life. 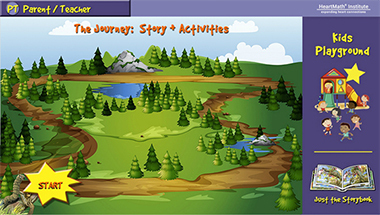 This e-Learning Program is applicable for children in the home or school classroom. Sunshine Secret is child friendly, so once an adult logs in, even young children can easily navigate the program by themselves. Come and Explore the Sunshine Secret! As children follow the wonderful story of Gloria the glowworm and Leon the Chameleon’s delightful world in the forest, they must complete support activities that encourage positive emotional outcomes. 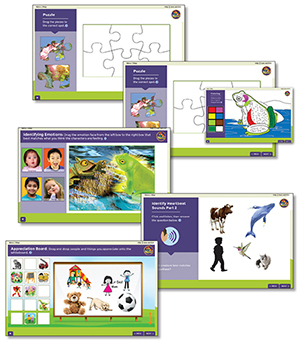 Among these are putting together virtual puzzles, coloring exercises with the Sunshine Secret story’s characters and learning emotion vocabulary words. Children love practicing the easy-to-learn Heart Shine self-regulation tool. It teaches them how to replace negative emotions such anger or hurt with positive ones like understanding, compassion and hope. Heart Shine is a wonderful way for children to learn that relying on their natural uplifting qualities of the heart can guide them through any situation. Identifying and matching emotion faces of children to emotion faces of Leon and Gloria. Heart Shine technique, a guided self-regulation tool. Promoting positive attitudes and feelings with the Appreciation Board. Singing along with three wonderful songs to reinforce key program concepts and skills. Animated videos with fun, age-appropriate science content, including a frog’s life cycle, the sun and more. Heart-Breathing Pacer, practice a self-guided technique while using a simple tool that helps regulate their breathing.